Aries constellation is located in the northern hemisphere. Its name means “the ram” in Latin. 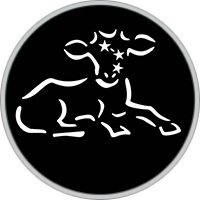 The symbol for the constellation is ♈ and it represents a ram’s horns. The constellation is usually associated with the story of the Golden Fleece in Greek mythology. Like other zodiac constellations, Aries was first catalogued by the Greek astronomer Ptolemy in the 2nd century. Aries contains several notable deep sky objects, among them the unbarred spiral galaxy NGC 772 and the dwarf irregular galaxy NGC 1156. Babylonians identified Aries as the agrarian worker, the last stop on the ecliptic. The name of the constellation later changed to Ram, but why Babylonians changed it is uncertain. In the 7th century BC, Neo-Babylonians did a revision of the Babylonian zodiac that placed Alpha Arietis, Hamal, very close to the vernal equinox, which is how Aries came to be so prominent among the zodiac signs in astrology. In those times, Aries contained the equinox, the point at which the Sun crosses the celestial equator from north to south. Because of precession (slow wobble of Earth’s axis), the vernal equinox is no longer in Aries, but in Pisces. In 130 BC, however, it was located just south of Gamma Arietis (Mesarthim) and was taken to be the starting point of the zodiac. In Greek myth, Aries is identified with the golden ram that rescued Phrixus and took him to Colchis, where he sacrificed the ram to the gods. The ram’s skin that he placed in a temple was the Golden Fleece, which later appears in the story of Jason and the Argonauts. Phrixus was the son of a Boeotian king. He had a twin sister, Helle. The children had a stepmother, Ino, who hated them and wanted to get rid of them. She came up with a plan to put the land of the brink of famine by making sure the wheat crops failed. When a man was sent to consult the Oracle at Delphi, Ino bribed him to lie and say the Oracle asked for the king’s children to be sacrificed if they did not want the people to starve. Phrixus and Helle were about to die when a winged ram with golden wool came to their rescue. The ram was sent by their real mother, the cloud nymph Nephele. It took both children and flew east to Colchis. Only Phrixus survived the journey. Helle fell off the ram and drowned in the Dardanelles. The strait was later renamed to Hellespont, or sea of Helle, in her memory. Phrixus was welcomed by King Aeëtes of Colchis, to whom he presented the Golden Fleece. In return, the king gave Phrixus his daughter Chalciope’s hand. How to find the constellation Aries in the sky? Although Aries is the 39th largest constellation in the sky and takes up an area of 441 square degrees, there is nothing in its shape that seems to justify such a large “surface area”. Furthermore, even the most ardent student of constellation shapes would be hard pressed to identify a ram in the constellation, while practical-minded observers of Aries are likely to see nothing more than a kinked line made up of four moderately bright stars. Aries is a northern hemisphere constellation that can be observed from latitudes of between +90° and -60° , making it also visible to observers across much of the southern hemisphere. It can be found between Taurus to the east and Pisces to the west, near the “Great Square” of Pegasus. This constellation can also be located by following an imaginary line from Polaris in Ursa Minor past the star Segin in the Cassiopeia, until you reach the Pleiades and the Great Square of Pegasus. From the northern hemisphere, Aries is best seen in the winter and spring time, with the constellation culminating at about 10 p.m. local time during the last days of November, and again at about 8 p.m. local time in late December. 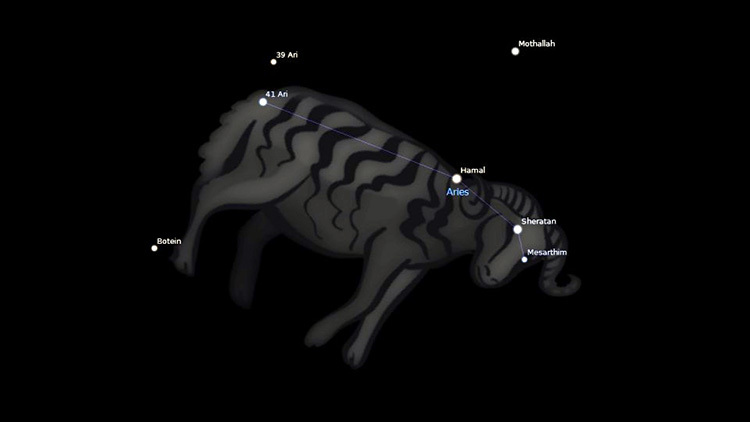 During these times, Aries is visible for most of the night, but as it is not among the most conspicuous constellations, a dark sky is needed to see it best.